50th Avenue was built as part of the 1910 extension of the Douglas Park branch to 52nd Avenue (Laramie). 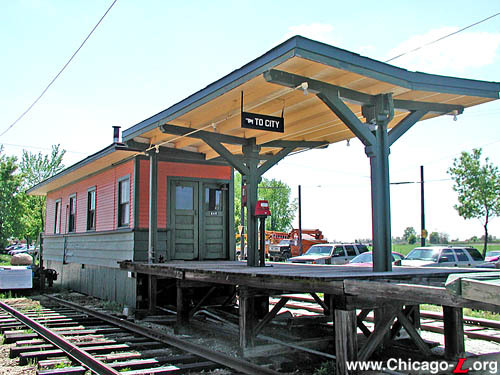 The station resembled those at Laramie and Oak Park: a wood-frame clapboard structure set in the middle of the tracks and opening onto a relatively short wooden island platform with an even shorter canopy. The exterior featured a hipped roof with eaves that extended out about a foot. The front featured one set of double doors, while the sides are broken up by several double-hung sash windows. The interior was floor-to-ceiling tongue-in-groove paneling, wood floors and paneled ceilings with a small ticket booth near the entrance, benches along the walls, a boiler stove for heat and incandescent lights for illumination. 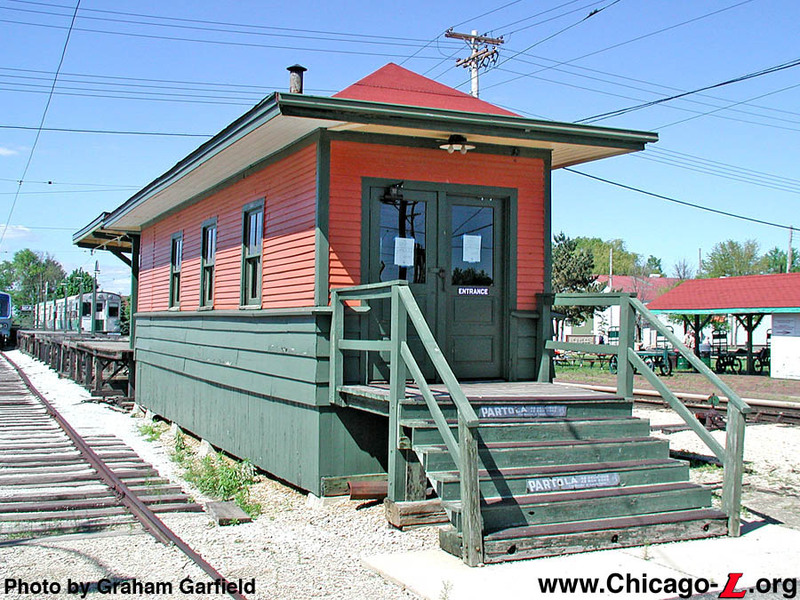 In the 1920s, the station was painted orange, yellow and green to match the livery of the "L" cars at that time. 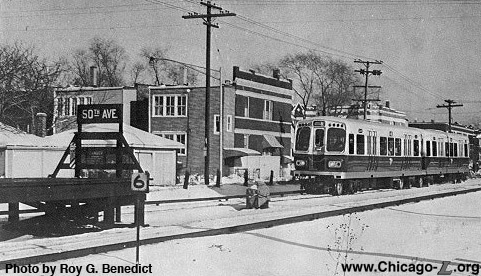 In December 1951, the CTA® instituted A/B skip stop service on the Douglas branch, though it changed several times between 1951 and 1958, in which time 50th was an an A station (1951) and finally a B station (1958), which it remained. 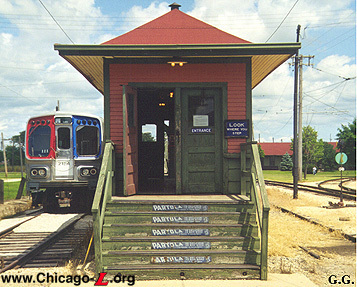 The station survived decades into the CTA's® reign (unlike many of its Douglas Park brothers). The station closed in one of several service purges in 1973, but reopened in January of 1974 with an unusual service schedule: the station was exit-only from 1400-1800 hours Monday-Friday, with boarding and alighting at all other times. Four years later, the station closed for good when an auxiliary entrance to the new Cicero station was opened at 49th Avenue. At this point, something almost unparalleled in Chicago rapid transit preservation history occurred. The 50th Avenue station -- building, platform, lights and all -- was disassembled, neatly cataloged and stored, and taken to the Illinois Railway Museum in Union, Illinois. There, it was reassembled, given a new paint job and the inside was restored. Historic maps and artifacts from the "L" decorate the interior, while the platform is adorned with authentic lights, reproduction blue and white enamel station signs, and a CTA® transfer stamp machine. There were no Chicago Surface Lines routes to transfer to at 50th Avenue, and although the CRT did begin allowing transfers to Chicago & West Towns Railways streetcars and buses in 1938, the closest West Towns lines were at 48th and 52nd Avenues. As such, the transfer stamp machine displayed at the station is somewhat anachronistic, but provided a relatively good context in which to display an authentic "L" transfer validator. The island platform is flanked by two tracks, which often have IRM's 2000-series, 6000-series or 1-50 series cars on them for additional effect (and convenient storage). We highly recommend a visit to the IRM to visit this preserved treasure.